Illustrations may differ from the actual vehicle depending on the device settings and options. Therefore, some detailed areas may not be shown exactly the same as on the actual vehicle. If the system cannot enter the diagnostic mode, inspect all AVC-LAN communication components and repair or replace problem parts. 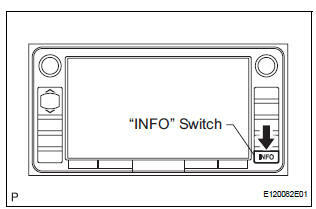 After the ignition switch is turned ON, check that the map is displayed before starting the diagnostic mode. Otherwise, some items cannot be checked. There are 2 methods to start diagnostic mode. Start the mode by using one of them. While pressing and holding the "INFO" switch, operate the light control switch: OFF Turn ON Turn OFF Turn ON Turn OFF Turn ON Turn OFF. The diagnostic mode starts and the "System Check Mode" screen will be displayed. Service inspection starts automatically and the result will be displayed. Switch to the "Display Check" screen. From the display quality adjustment screen, touch the corners of the screen in the following order: upper left lower left upper left lower left upper left lower left. There are 2 methods to end diagnostic mode. Use one of them. Read the system check result. If the check result is "EXCH", "CHEK" or "Old", touch the displayed check result to view the results on the "Unit Check Mode" screen and record them. If all check results are "OK", go to communication DTC check. If a device name is not known, its physical address is displayed. HINT: When proceeding to view the results of another device, press the service switch to return to the "System Check Mode" screen. Repeat this step. Read the communication diagnostic check result. Return to the "System Check Mode" screen, and press the "LAN Mon" switch to enter the "LAN Monitor" screen. If the check result is "CHEK" or "Old", touch the displayed check result to view the results on the individual communication diagnostic screen and record them. If all check results are "No Err", the system judges that no DTC exists. The sub-code (relevant device) will be indicated by its physical address. When proceeding to view the results of another device, press the "Service" switch to return to the original "LAN Monitor" screen. Press the "Code CLR" switch for 3 seconds. Confirm that all diagnostic codes are "OK" when the check results are displayed. If a code other than "OK" is displayed, troubleshoot again. Press the "LAN Mon" switch to change to the "LAN Monitor" screen. Confirm that all diagnostic codes are "No Err". If a code other than "No Err" is displayed, troubleshoot again.